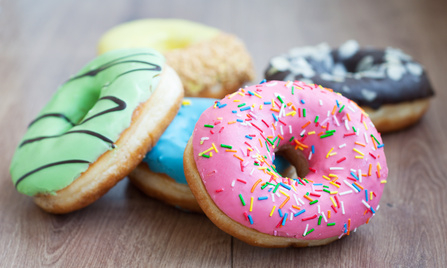 The word has long been out about trans fats – they are Bad with a capital B. In fact, they are so bad that the Food and Drug Administration (FDA) is trying to remove all artificial trans fats from the food supply – a step they say will reduce heart disease and prevent thousands of heart attacks each year. In order to make unsaturated fats (vegetable oils) harder and stay fresher for longer, many food producers force hydrogen into the liquid oil (hydrogenation). The result is a much more stable, saturated, and spreadable product with greater resistance to damage from high temperatures. However, one side effect of this process is the creation of trans fatty acids, or trans fats. They are fatty acids that have unusual shapes that alter the way in which they are metabolized by the body. The result is not good. Trans fats raise LDL cholesterol levels (the ‘bad’ stuff) and lower HDL cholesterol levels (the ‘good’ stuff), contributing to the build up of plaque in the arteries, and creating an increased risk of developing heart disease. Where do you find these trans fats? While they occur in very small quantities in nature, they come predominantly from commercially made cookies, crackers, cakes, pies, snack foods, creamers, stick margarines, refrigerated dough products, and ready-to-use frostings. How do find out if your food contains these nasty little fats? It might be harder than you think. In the United States, if a food product has less than 1/2 gram of trans fat, the label is allowed to state that it contains no trans fat. That means that the nutrition label of a food item might be misleading when it comes to trans fat. If a food has 0.49 grams of trans fat, the label will say that it contains 0 grams. And while less than 1/2 gram might not seem like much, if you multiply 0.49 grams of trans fat by five, you are consuming almost 2.5 grams of trans fat without knowing it. The good news is that there is one other, little-known way to identify trans fats in commercially produced foods. Check the ingredient list. If any of the ingredients begin with the phrase “partially hydrogenated”, you know the food contains trans fats, even if the label says it does not. (1) Trans fats are not good for us and we should take steps to eliminate them from our diet. (2) Ideally, we should avoid commercially produced baked, fried, and frozen goods, processed snacks (like microwave popcorn), as well as margarines and coffee creamers. (3) If number 2 is not realistic for you, check the nutrition facts label. If it says the food contains trans fats, put it back. If it says it contains no trans fats, but the ingredient list includes a ‘partially hydrogenated’ oil, put it back.